CAIRO — An angry crowd of thousands gathered at the largest cathedral here on Monday to mourn the death of two dozen Coptic Christian demonstrators killed the night before in clashes with security forces, as liberal activists lamented the military’s increasingly tight hold on power. The bloodshed appeared to mark a turning point in the revolution, many here said. It comes just eight months after Egyptians celebrated their military as a savior for its refusal to use force against civilians demanding the ouster of President Hosni Mubarak. Confidence in the military had already been eroded by its repeated deferrals of a handover of power to civilian rule, now set to take place perhaps as much as two years after parliamentary elections, set to begin next month. Now political liberals as well as Copts said the brutal crackdown had finally extinguished the public’s faith in the ruling military council as the guardian of a peaceful transition to democracy. Others took an even darker view, saying that the violence suggested that the military may now hold an even tighter grip on power than Mr. Mubarak did. Witnesses, victims and doctors said Monday that demonstrators were killed when military-led security forces drove armored vehicles over as many as six people and fired live ammunition into the crowds. Doctors at a Coptic hospital showed journalists 17 bodies, including one with a crushed skull and others with mangled limbs. Doctors and Interior Ministry officials said bullet wounds accounted for most of the deaths, including that of Mina Daniel, a young political activist a doctor said had been shot in the shoulder and leg. More than 300 others were wounded in four hours of street fights, the Health Ministry said. The military council did not explain Monday why shots were fired or why military vehicles ran over demonstrators. The military also sought to appease the Coptic Christians, about 10 percent of the population here. Although the Copts had embraced the revolution’s promise of a tolerant and pluralistic democracy, many have been uneasy as the removal of Mr. Mubarak’s iron fist has unleashed suppressed rivalries, as in the recent dispute over the construction of a church near the southern city of Aswan that inspired the march in Cairo on Sunday. The military said it had asked its civilian prime minister to begin an investigation into the violence, and Egyptian news organizations reported that at least 15 suspects were being prosecuted in military courts for instigating the riots. The civilian cabinet, meanwhile, announced a series of long-promised measures to deter discrimination. The measures would impose jail time and large fines on anyone found guilty of discrimination on the basis of religion, with heavier penalties for government employees. And to address the legacy of cumbersome rules on permits to build churches, the cabinet said it would implement a law to standardize procedures for all houses of worship. The minister of information also backed away from state television coverage of the protests on Sunday that urged “honorable Egyptians” to defend soldiers from a mob of armed Christians. The announcers who made those statements were “under emotional stress,” the minister, Osama Heikal, said, according to the Web site of the state-run newspaper Al Ahram. While the liberal parties denounced the military’s handling of the protest, the Muslim Brotherhood​, the Islamist group considered the principal opposition under Mr. Mubarak, adopted a tone notably more sympathetic to the government. In a measure of their growing distrust of the military-led government, the families of the Copts killed in the violence decided they did not trust government-run facilities to perform autopsies, fearing the results might hide evidence of the violence by security forces. After hours of deliberation with priests, activists and human rights groups, they arranged to bring forensic teams to a Coptic hospital, causing the funeral to be called off. Inside the hospital, Mariam Telmiz, 40, sat at the bedside of a brother-in-law who had been wounded by a bullet at the demonstration. Another brother-in-law had been killed by a bullet. Heba Afify contributed reporting from Cairo. It is unclear what either Western governments or Western churches think they are achieving by turning a blind eye to the persecution of Christians in the Muslim world. 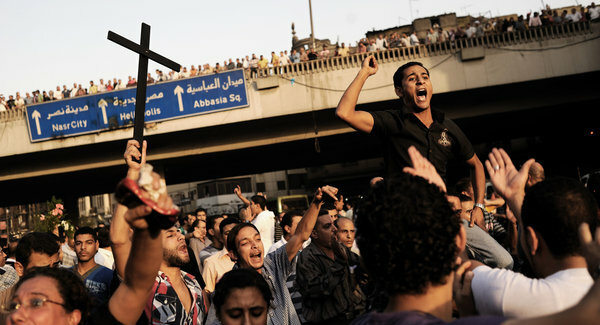 This entry was posted in Coptic Christians, Egypt, Persecution of Religious Groups, religious persecution. Bookmark the permalink.